As it turns out, unsigned apps on macOS High Sierra (and potentially earlier versions of macOS) can allegedly access the Keychain info and display plaintext usernames and passwords without a user's master password. For this vulnerability to work, a user needs to download malicious third-party code from an unknown source, something Apple actively discourages with warnings about apps downloaded outside of the Mac App Store or from non-trusted developers. In fact, Apple does not even allow apps from non-trusted developers to be downloaded without explicitly overriding security settings. 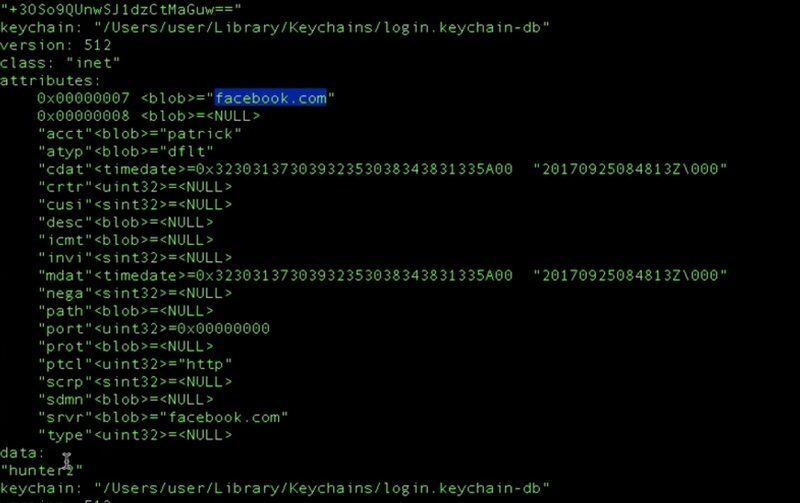 As demonstrated in the video above, Wardle created a proof-of-concept app called "keychainStealer" that was able to access plaintext passwords stored in Keychain for Twitter, Facebook, and Bank of America. Wardle spoke to Forbes about the vulnerability and said it's actually not hard to get malicious code running on a Mac even with Apple's protections in place. "Without root priveleges, if the user is logged in, I can dump and exfiltrate the keychain, including plaintext passwords," Wardle told Forbes. "Normally you are not supposed to be able do that programmatically." "Most attacks we see today involve social engineering and seem to be successful targeting Mac users," he added. "I'm not going to say the [keychain] exploit is elegant - but it does the job, doesn't require root and is 100% successful." Wardle has not provided the full exploit code for malicious entities to take advantage of, and he believes Apple will patch the problem in a future update. As Wardle has not released the full exploit code, it has not been double-checked by MacRumors or another source, so full details on the vulnerability are not known just yet. Apple has not yet responded to requests for comment about the potential vulnerability. 1. Would have been even greater if Apple had ppl who found these kind of bugs themselves before release. 2. You don't know if he found this yesterday. But sure hate on the guy who might have prevented your bank account password from ending up in the wrong hands. On release day. That's embarrassing. OMG, to enable this software you have to enter System Preferences, answer YES on two dialogues, and also enter your password. Then it may STEAL your not encoded things stored in the keychain (by default everything is stored encoded). I think I'm going to Windows now. This is just too much!!! sigh. don't download junk, don't jeopardize your computer. Common sense is the best anti-virus. If he did find it yesterday, he should have disclosed it to Apple and given them 90 days to fix it. He doesn't owe Apple anything. Just like Apple doesn't owe him anything. He did them a favour. I see a lot of people assuming he didn't contact Apple. Does he explicitly say that somewhere? All I see is "Apple has not yet responded to requests for comment". Because if he DID contact Apple and was ignored, he could have either waited for final version to check whether a fix was implemented, then notified general public immediately, or kept the information to himself and waited until tons of people get their computers hacked. Ah, so Microsoft is hiring these people to expose things on release day. Nice. LOL, MS has no interest or desire. This isn't 1990, and the PC wars are long over. lol, c'mon on day 1!!!!? !